It’s been so long since anyone has seen either a tenter, or the hooks on one, that the word and the idea behind it are now quite mysterious, but at one time, the phrase on tenterhooks would have evoked an image that was immediately understandable. 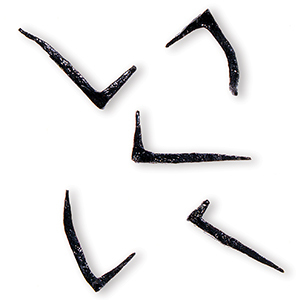 Tenter hooks were L-shaped staples, much like a bent nail, placed at regular intervals on a rectangular wooden tenter frame. When cloth emerged wet from the fulling process it was stretched out on these hooks, preventing it from shrinking as it dried – hence the phrase ‘being on tenterhooks’. 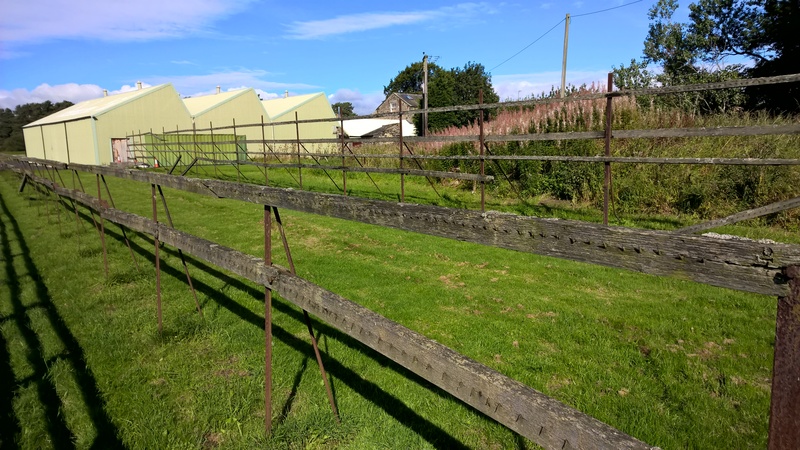 What may be the last remaining 18th century tenter frames in the world, at Otterburn Mill, Northamptonshire, England. It comes from one of the processes of making woolen cloth. After it had been woven, the cloth still contained oil and dirt from the fleece. It needed to be fulled and blocked, much like handknitters treat their finished garments today. After fulling, the cloth was stretched taut on frames, or tenters, and the tenter hooks were the metal hooks used to attach the cloth to the frame. At one time, it would have been common in manufacturing areas to see fields full of these frames (older English maps sometimes marked an area as a tenter-field). So it was not a huge leap of the imagination to think of somebody on tenterhooks as being in an state of anxious suspense, stretched like the cloth on the tenter. The tenters have gone, but the meaning has survived. Thank you. I always thought it was tenDerhooks. I appreciate being able to spell it correctly, now, as well as know where it came from. I’ll think of it everytime I block wool, now. Thank you, Chris and Sandi. I know there are lots of us interested in the minutia of history and/or textiles. You do such a lovely job of introducing us to things that used to be commonplace but have lapsed into obscurity. Thank you for the research, the teaching and the way you teach us to learn. It is truly appreciated. I was doing some family history and found a family member who wrote in 1847 “Our Jennet has begun to work. She is a tenter at the power looms and she began last Christmas.” She was 12. Interesting bit of reality. Thanks for sharing, Mary.